Bouchon (BOO-shone) is the French word for cork; hence the name of these little chocolate cookie-cakes*, made in timbale molds, also called baba molds. 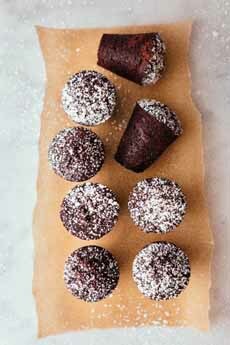 They are rich and brownie-like, and the inspiration for Thomas Keller’s Bouchon Bakery (here’s his bouchon recipe). These chocolate “corks” are an ideal sweet for New Year’s Eve, and you can serve them for dessert with a sweeter champagne or other sparkling wine for dessert. This recipe, from Good Eggs, combines dark cocoa powder and melted semisweet chocolate make these bouchon: way to go to usher in a sweet new year. Note that there are two different sizes of timbale pans. Depending on which you choose, you’ll have dessert size or nibble size pieces. 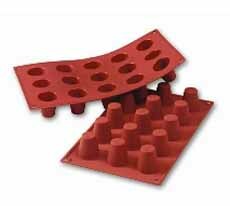 You can also use timbale molds for other baking, shaping mousse and gelatin, vegetable sides, ice cubes and chocolate—especially chocolate-on-a-stick, a fun way to make hot chocolate. You can also use mini-muffin pans, but you lose the cork shape. *Technically, a cake is eaten with a fork, and a cookie is finger food. Bouchons, like brownies, are finger food; although they can be served as a cake, with ice cream, whipped cream or other garnish. †Cocoa rouge (red cocoa) is a Dutch-process cocoa that lends baked goods a particularly appealing reddish color. In some brands it is the same color as ditched chocolate; but other brands sell a much lighter, tanner, ditched chocolate. You can substitute conventional ditched cocoa if that’s what you have. Usher in the new year with cork-shaped bouchons au chocolat (photo courtesy Good Eggs). A silicone timbale mold (photo Fat Daddio’s). 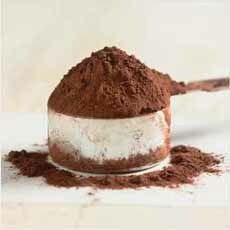 Cocoa rouge (photo courtesy King Arthur Flour). 1. PREHEAT the oven to 350°F. Butter the inside of the timbale molds or muffin wells and cover with powdered sugar. 2. SIFT together in a small bowl the cocoa powder, flour and a pinch of salt. In a larger bowl, use a hand mixer to beat the eggs, vanilla and granulated sugar for a couple of minutes, until they’re well combined and light yellow in color. 3. BEAT about a quarter of the dry ingredients into the wet mixture, with the mixer on its lowest setting. Then do the same with a quarter of the butter. Repeat until all of the dry mixture and butter have been combined. Gently fold the chopped chocolate into the batter with a silicone spatula until it’s pretty evenly distributed. 4. USING a pastry bag, a ziploc bag with the tip cut off, or just spoon, fill each of the timbale molds until they’re just over half full. Bake for 20 to 25 minutes, or until a toothpick inserted comes out largely clean—except for the bits of melted chopped chocolate!